Durham’s first gay pride march, Our Day Out, was held in 1981 in response to the murder of a man assumed to be gay. The first PrideFest was held five years later, in June of 1986, when the AIDS epidemic was beginning to be felt in communities outside of large urban centers and the homophobic Jesse Helms had recently been reelected to the Senate. Although organizers’ fears of Klan violence did not materialize, backlash was felt in other ways. Editorials that disparaged the gay pride movement cropped up in the local newspapers throughout the summer, and a campaign was begun to recall Mayor Wib Gulley, who had endorsed PrideFest. The necessary number of signatures was not gathered, however, and Gulley won the next election handily. I am thinking of the lesson of liberation from the slavery, exploitation, and alienation of Egypt to a land where the people can live with human dignity. … And what is the meaning of this story? First, that wherever we live, it is probably Egypt. Second, that there is a better place, a world more attractive, a promised land. And third, that the way to that promised land is through the wilderness. There is no way to get from here to there, except by coming out, joining together and marching. After the first PrideFest, a wave of similar festivals was held across the state. 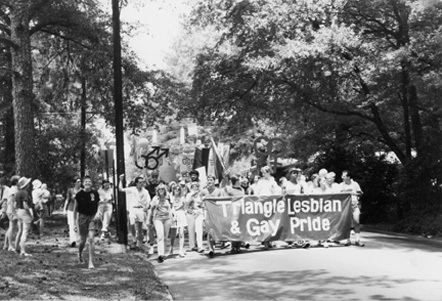 For the next decade, PrideFest alternated among several North Carolina cities before becoming an annual Triangle event in 2000.